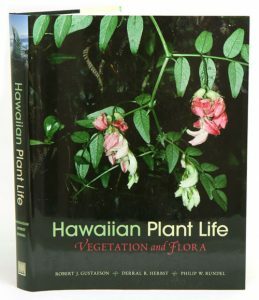 Hawaiian plant life: vegetation and flora. Artist/Author: Gustafson, Robert J. et al. This book is written with both the layperson and professional interested in Hawai’i’s natural history and flora in mind. In addition to significant text describing landforms and vegetation, the evolution of Hawaiian flora, and the conservation of native species, the book includes almost 875 colour photographs illustrating nearly two-thirds of native Hawaiian plant species as well as a concise description of each genus and species shown. The work can be used either as a stand-alone reference or as a companion to the two-volume Manual of the Flowering Plants of Hawai’i. Learning more about threatened and endangered plants is essential to conserving them, and there is no more endangered flora in the world today than that of the Hawaiian Islands. Striking species complexes such as the silverswords and the remarkable lobeliads represent unique stories of adaptive radiation that make the Hawai’i a living laboratory for evolution. Public appreciation for Hawaiian biodiversity requires outreach and education that will determine the future conservation of this rich heritage, and Hawaiian Plant Life has been designed to help fill that need. 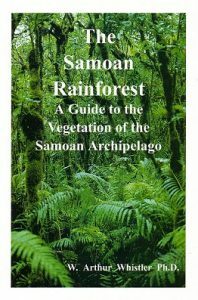 The Samoan rainforest: a guide to the vegetation of the Samoan archipelago. The Samoan Rainforest is based on numerous visits to Samoa by the author during the last thirty years to study the vegetation of Samoa. Most vegetation studies are not correlated with the flora, but in this book every effort is made to tie in the flora of Samoa with the Vegetation. This book is directed at students from Samoa or overseas at the university, community college, or high school level wishing to study the vegetation of the archipelago. It should be particularly useful for biologists and teachers in Samoa wanting to know more about their own local tropical environment (as well as about the world tropics). It is meant as a beginning – to give an overall view of the vegetation and its associated species. Hopefully, it will stimulate or facilitate others to continue the quest. 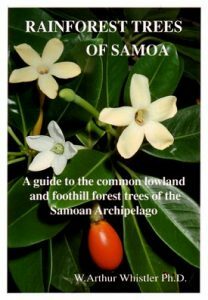 Rainforest trees of Samoa: a guide to the common lowland and foothill forest trees of the Samoan archipelago. Information on over 140 species includes the scientific, Samoan and English names, the botanical family to which the plant belongs, and the range of the species. 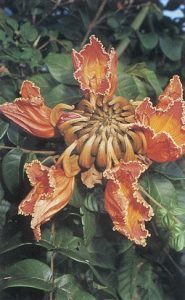 This is followed by the habitat, ethnobotanical uses in Samoa, and a complete botanical description. Colour photographs of each tree assists in the identification. A table is provided that shows the island distribution of each of the species within the Samoa archipelago. Designed to be of use to foresters, botanists, naturalists, teachers, students, or just nature lovers who visit the archipelago. It is also a very useful guide to the trees of Tonga, Niue, and the Cook Islands, since most of the species covered also occur in these archipelagos and islands. Also included are six tree species that are new to science (two of them from Tonga). Wayside plants of the islands: a guide to the lowland flora of the Pacific Islands including Hawai’I, Samoa, Tonga, Tahiti, Fiji, Guam and Belau. Guide book to the identification of the most common plant species encountered in the lowlands of the Pacific Islands.